I happened upon another entry in Cigar Aficionado's top 25 of 2011 list while visiting one of my favorite cigar shops in town. The Illusione Epernay. While not the exact size they rated at number 3 on that list, it still caught my eye. 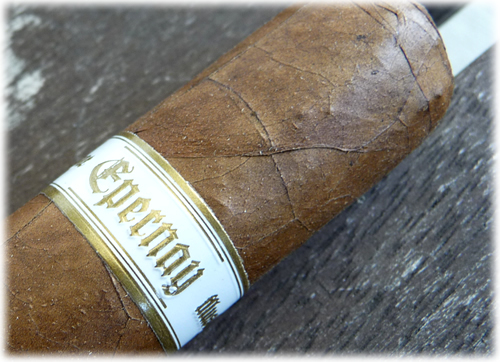 An attractive no-cellophane presentation somewhere close to a classic robusto or cornona size, the Epernay Le Ferme glows with a beautiful oily sheen on a rosy red brown wrapper. Construction: This thing is flawless. Perfect cap, not a blemish on the wrapper....Just looking at it made my mouth water. 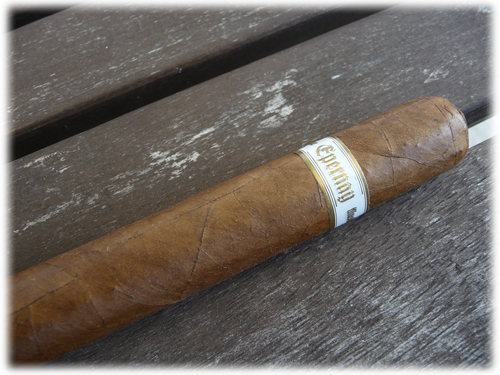 Pre-light Aroma and Draw: There is a very rich sweet tobacco aroma to the unlit stick. I was impressed at how dense the aroma is, actuallly. After a quick cut I noticed something shocking.....The draw was flawless. I never had to struggle to draw a mouthful of smoke nor did I have to slow down because it burned to fast. I am used to this kind of draw from Tatuaje and Don Pepin cigars so to find it in a brand new cigar I have never seen before reallly shocked me. Light and Burn: Nearly flawless in both areas. The light was instant, producing a dark gray ash with a exceptional burn. I had to touch up a couple of slow burning spots during the smoke but neither of them were anything horrible. Tasting: So much like a Cuban, I have trouble believing it is not one. Sweet honey-like metallic tobacco from start to finish. While not as complex as the Don Pepin or Tatuaje brands, it was amazingly enjoyable from start to finish. The core of the flavors hinted at rich fine tobacco with an excellent creamy finish. Truly something special. Value: At about $9, the Le Ferme is adequately priced for a cigar of its size - and a bargain for such quality. Final Thoughts: I am already wishing I had picked up a handful of these. That honey-like flavor is just exquisite. Is it one of the best cigars ever made? Honestly there is a strong case for words that powerful here. This is a highly memorable smoke - one that cigar smokers even 100 years ago or 100 years from now would appreciate. I would rate the Epernay in my top five of the year at this point. Highly recommended! Just look at that oily sheen!